It was GREAT FUN – I purchased this game to use for my 30th birthday party and it was a HUGE success. Everyone had such a great time – people were even trying to resolve character "disputes" over the next couple days! Several guests have told me that they want to do something similar for their own get-together. I've referred EVERYONE to your site :)"
"Thanks so much – everyone at our party thoroughly enjoyed the complexity of Way out West. There were so many more mysteries to be worked on besides the murder and all members of the party enjoyed having so much to do. We never had a 'dull' moment! " "Just wanted to email you all and say what a fantastic day we had Saturday night when we ran Way out West. We all had a blast, everyone dressed up and got into the spirit of things... Nearly a week on, we are still talking about it, and the photos have proved a great success! I am hoping to run another on New Year's Eve, so will probably email you at the time asking for help on that one!" "Way out West was a very good simple theme for people to obtain fancy dress and get into their characters – with no excuses of not being able to find a costume! This was our first attempt at a freeform game and I think it was very successful and was much more of challenge than a previous murder mystery game we played. Once people got over the shock of actually having to think for themselves they all got into it! No-one guessed correctly who the murderer was! " "Our Way out West party was a great success. My husband was the bartender and I helped. We had an adult playing Kate and 18 year old playing Christy and the rest were 11 and 12. They did great and were even trying to settle the land dispute the next day at school! " "Just wanted to say thanks. We held our Way Out West party last night and it was a huge success. Everyone had a great time and the characters worked out perfectly. Will check back every so often to see if any new ones come out as I am sure the group would enjoy another mystery at some point down the road. As for me, I have to rest up -- keeping track of everything has worn me out. I enjoyed the system and look forward to trying another one. Thank you for your help." "It was the very first time that I ever participated in any murder mystery game and it was great!! I hosted Way out West. People loved it and are asking for more :D ! The players were so creative! [Character X] was pretty smart, they got the cards and everything they needed to be all set. Then in the end [Y] and [Z] put the map together so they could find the silver lode, give money to [A] and they could buy the Range from [B]. It was awesome!!!!" "We got the free version of Way Out West and wound up purchasing the Expansion pack. We bought it for our couples' class to do at church. It turned out so well, everyone had a blast and we are looking forward to doing our next one this year. You guys offer an awesome experience for a good price. We just purchased our next mystery for this year All At Sea and are incredibly excited to start planning it and getting it together :) Thanks!" "First we must thank you for the creative and all round FUN evening we had last night, hosting Way out West Expanded (kids' version) for 27 people!! My husband and I decided to host a murder mystery as an opportunity for peeps in our home group to get to know the church staff better – it was both hilarious and VERY successful. "I am so glad I began my journey with murder mysteries playing a Freeform game. I have heard of many other more controlled or directed games. I doubt those will ever have the same attraction as the working out of a unique sequence of events, determined by the players!" 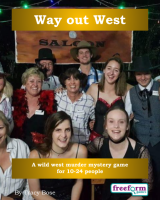 "We hosted our first Murder Mystery dinner game, Way out West, at our bed and breakfast two weeks ago for a group of friends. My husband didn't want to participate at first, but after a half hour of playing the murderer he had a great time. We're hoping to make murder mystery dinners a regular event at the B&B and really like the format and stories you've developed." "We played Way out West on New Year's Eve and really enjoyed it a lot. I have flagged your website in my favorites so we can easily access you next year if not before. Thanks for all of your hard work on this game." Way out West is a dinner party murder mystery game for 10 to 24 guests and a host – download the free introductory pdf file. Way out West lasts for about four hours and is suited to an evening. It is often played over a meal – a finger buffet if possible to allow guests to circulate and talk in private. "Thanks for a great party – definitely recommend Way out West to friends!" The free introductory pdf file contains an introduction to the game, a cast list of all the characters, and a copy of the Cactus Gulch Gazette – plus details of how to buy the game. Way out West is unlike many murder mystery games. Although the game starts with a murder, most of the characters have more important things to do than to investigate it. And the killing may not be over – it is unlikely that everyone will survive the remainder of the evening! "We received your game, Way Out West, and had our party last weekend. It was a huge success. Everyone went all out on their costumes and the game flowed smoothly. Thanks for your great customer service!" Way out West costs £20.00 (GB pounds) or US $29.99. You can buy it in either currency, from anywhere in the world, as you prefer. The price will be converted back into your own currency for you, at today's exchange rate. We offer a Cast Iron Guarantee on all our murder mystery games. If you're not completely satisfied with Way out West then please let us know within 30 days and we will refund you. See our full terms and conditions here.